Are you looking to provide DISC personality assessments and DISC profiles with your own company branding and logos? We have the solution! Feature your brand on EVERY page of the DISC profiles! 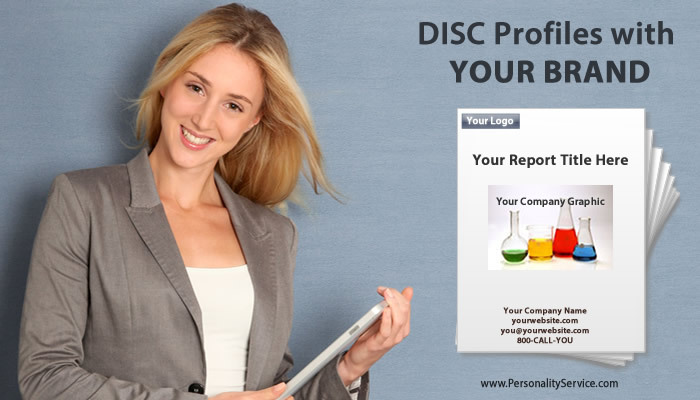 Offer a wide variety of DISC report versions to meet your client's needs. Includes a complete, ready-to-use DISC profiling system. Offer DISC profiles online and earn revenue with an automated turnkey e-Commerce solution. Track and monitor your account in your Resource Center 24/7. Get up and running in just 1 business day! Integrates with your website or social media sites. In short, you can add DISC profiles to your toolbox and increase your brand value overnight.